We're all busy people, so we totally understand if this particular bonus in your food storage product has gone unnoticed until now. Contain yourself: We have finally figured out the purpose behind the extra raised "ring" in the lid of your Glad To Go bowls. Sarah Rose noted in her now-edited caption, "HOW AM I JUST NOW finding out that the circle on these lids are actually lids for the tiny containers?! Someone please tell me I'm not the only one who didn't know this." Yep, that's right: It's meant to clip your little dressing container safely to the top of the container! It's an ingenious invention that Glad clearly explains to us in its packaging, but which many of us have simply allowed to go unnoticed or unused. Your lunch won't come pre-saturated with dressing if you use the lid properly.GLAD /Critical Mass Inc.
Glad To Go Lunch containers come with the little bowl even attached to that lid, but realizing that it was meant to be reused that way once you got home may have been easily overlooked. Hey, we're all busy people who can't notice everything. That's why we're taking our lunches to work! Built-in dressing containers for salad (and other food items) are not new in products, but often they're part of less-disposable items and are separate mini-containers entirely. 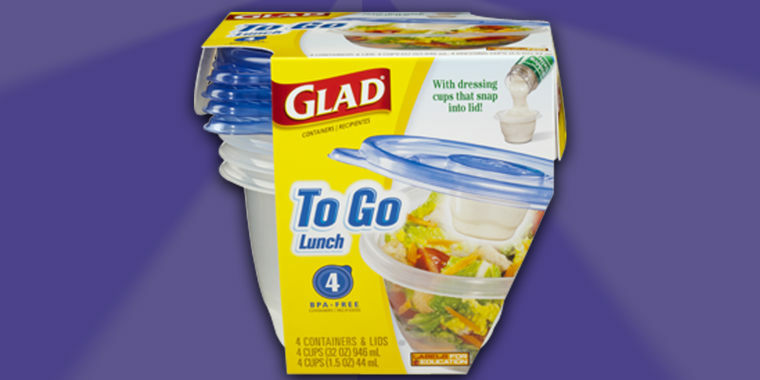 With Glad To Go, it literally all goes with you and if you need to you can recycle the whole thing when you're done. Aren't you glad you know this now? This post was originally published on Sept. 13, 2017.